11th lunar month of 1725: disciple of Anegawa Shinshirô I, he received the name of Anegawa Chiyosaburô I and made his debut on stage (hatsubutai) in Kyôto, where he performed as a wakaonnagata iroko in the kaomise drama "Sanpukutsui Eiga no Shikishi". 11th lunar month of 1731: Chiyosaburô played the role of the keisei Takahashi in the kaomise drama "Hiragana Imagawajô", which was produced in Kyôto at Miyako Mandayû's theater; his stage partners were Arashi San'emon III, Nakamura Tomijûrô I, Nakamura Shingorô I, Sanogawa Mangiku, Somenoi Hanshirô, Yashio Ikuemon and Tomizawa Montarô I. 11th lunar month of 1732: Chiyosaburô became zamoto and produced at Miyako Mandayû's theater the kaomise drama "Hatsu Butai Kogane no Ishizue", in which he played the role of Gendayû's musume Nishikigi and which celebrated the shûmei of both Kirinoya Gonjûrô II and Haruyama Genshichi II. 1st lunar month of 1733: Chiyosaburô's rank in the Kyôto hyôbanki, wakaonnagata section, was jô-jô-(shiro)kichi (superior - superior - (white) excellent). He shared the same rank with Tomizawa Montarô I. 11th lunar month of 1733: Chiyosaburô produced in Kyôto the kaomise drama "Meotogura Kogane no Masugata". Fall 1734: Chiyosaburô and Nakamura Shingorô I went together to Edo. 11th lunar month of 1734: Chiyosaburô performed at the Nakamuraza in the kaomise drama "Kyôganoko Secchû no Tamatori". 1st lunar month of 1735: Chiyosaburô's rank in the Edo hyôbanki, wakaonnagata section, was jô-jô-kichi (superior - superior - excellent). He shared the same rank with Segawa Kikunojô I and Sanjô Kantarô II. 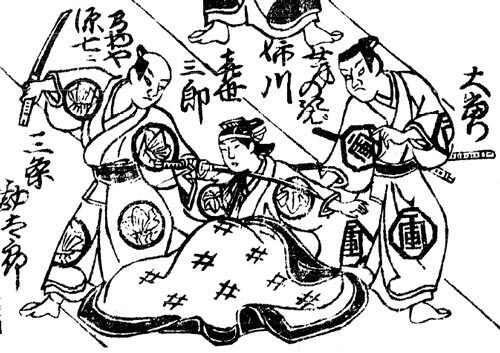 11th lunar month of 1735: Chiyosaburô played at the Nakamuraza the role of the musume Tegashiwa in the kaomise drama "Tono Zukuri Shinoda Zuma". 1st lunar month of 1736: Chiyosaburô's rank in the Edo hyôbanki, wakaonnagata section, was jô-jô-(hanshiro)kichi (superior - superior - almost excellent). He shared the same rank with Segawa Kikujirô I. 11th lunar month of 1736: Chiyosaburô moved to the Ichimuraza, where he played the role of Princess Tatsu in the kaomise drama "Izu Genji Hôrai Yakata", which celebrated the arrival in Edo from Kyôto of the actor Tomizawa Montarô I and the shûmei of Tsuruya Nanboku II. 11th lunar month of 1737: Chiyosaburô performed at the Nakamuraza in the kaomise drama "Soga Monogatari Osana Nikki", which celebrated the arrival in Edo of the Kamigata actors Yamamoto Kyôzô, Yamamoto Hikogorô and Kaneko Mantoku. He also took the name of Anegawa Kiyosaburô at the end of the 11th lunar month in the same theater, playing the role of Kurando's spouse in the drama "Shin Yakata Kôyôgun". 1st lunar month of 1738: Kiyosaburô appeared on stage for the last time, at the Nakamuraza, where he played 2 roles in the new year sogamono "Takara Soga Nyogo no Shimadai". 3rd lunar month of 1738: Chiyosaburô's rank in the Edo hyôbanki, wakaonnagata section, was back to jô-jô-kichi (superior - superior - excellent). He shared the same rank with Tomizawa Montarô I. 1738~1739: he fell ill and retired from the Kabuki world. Anegawa Kiyosaburô made a short but successful career from the middle of the 1720s to the end of the 1730s. Trained in Kyôto as an onnagata actor, he achieved fame for himself in Edo. He was said to be an excellent dancer.